I have been blogging here at Human In Recovery, on and off, since December 2011. During that time I have participated in The Ultimate Blog Challenge, as I am doing this month. Something which seems to happen during these challenges is bloggers giving each other blogging awards. These awards build community and networks. It boosts traffic and is an opportunity for bloggers to connect to a greater audience. It’s a way build their platform. I have been nominated for the Liebster Award, both when I participated in my first UBC (read about it here) and again during this cycle, by Vidya Tiru at Lady in Read Writes (read about it here). I will name 11 noteworthy blogs to explore. However, I am not requiring or expecting a Liebster acceptance post. 1. Is your blog personal or professional and what is its primary focus and/or topic? 2. Do you have a YouTube channel or podcast? If so, please provide the title or link. 3. Are you a contributing blogger/writer elsewhere? 4. What is the most valuable, free product/app/service you have found as a blogger? 5. What piece of information or advice would you have found invaluable as a beginning blogger? 6. What social media sites do use use for public interaction and how do we connect to you? 7. Are you an introvert, extrovert, or an ambivert (both to varying degrees)? 8. What core value do you try to live by? 9. If you had to choose an anthem song, what would it be? If possible, please provide a YouTube link. 10. If you had to choose, would you consider yourself an advocate or activist? 11. What is your favorite quote? Now, for those interested, we enter the “All About Me” part. * If you could take a vacation anywhere in the world, where would it be? * What is your favorite food to eat? * What advice would you give your younger self if you could go back in time ten years? * What would be the first thing you’d do if you won the lottery? * Night owl or early bird? * What superpower would you like to have? The ability to clone myself and experience the memories of all the clones while they share each other’s and mine. * Your favorite way to relax? Water aerobics or swimming followed by a soak in the hot tub, chatting with the people around me. * eBook or the printed book or audio book or no books at all? If conditions allow a book at all, paper. * What four words would you use to describe yourself? * Who is the most influential person in your life? Currently it is my youngest daughter, in the sense that pretty much all my decisions and conditions are made with her in mind and affected by her. * Do you make resolutions? If yes, what is your top resolution for 2018? Not anymore. However, my personal goal is to transition my eating to be primarily whole food, plant-based by 2019. 1. I am a 48 year old grandmother of three. 2. I have three children ages 31, 24, 9. 3. I am parenting a child who experiences the world through the Autism Spectrum. 4. My 31 year old stopped being legally my child in 2012. He went through an adoption process, as an adult, and legally became another mother’s child. Our estrangement has been reconciled. 5. I earned two diplomas and a GED. 6. I have the debt of one who earned a Bachelors degree. 7. I have no college degrees. 8. I have experienced two major nervous breakdowns. 9. I have a Bipolar brain impacted by PTSD. 10. I am married but have not seen my husband since December 12, 1988. 11. I am half Mexican. The ideas I share are received with more grace, acceptance and discussion in the business world than they are in the Christian world. When Christians disagree with your idea, they critique your soul. dropping a fake money tract on the ground is an incredibly effective use of my time. That saves me all that hassle of actually having a relationship with someone and telling them about God in that context. Relationships take forever, ugh. But when we as Christians attack each other’s souls we forever lose the ability to get better. When we can’t debate without it turning into a soul attack, we can’t grow. In this post, Jon referred to an incident where other publicly known Christians had chosen to openly criticize and misrepresent something he’d written. So often I see posts from my fellow Christians which contain critical, mean-spirited, hatefulness towards other believers, as well as non-believers, or followers of other faiths. Attacks on the people and their very souls and identities – the very souls and identities that the God we share and claim is a God of love, compassion, grace, and forgiveness created and cares for as much as we are cared for and loved. It saddens me and sickens me. I want to protest, publicly and loudly against these people. My instinct is to judge and criticize them for being so hypercritical and judgmental. Then, I realize what is happening within me. I understand that I’m afraid of being judged and criticized by association with them and that my identity and being will suffer an attack and backlash because of their words and actions. My identity is not in my association with them. It is in who God has made me to be and the love, grace, mercy, and compassion I have received from Him. This is available to all who are able to receive it. Since I have received compassion instead of condemnation, compassion is what I offer to others, whether I agree with them or not, whether they have hurt me or not, whether they deserve it or not. I have received compassion, forgiveness, grace, and mercy though I have not been deserving or worthy, but because I am loved regardless. So, it is not my place or position to decry and denounce my fellow believers, no matter how misguided or misplaced I believe their attitudes, words, and actions to be. It is not even my plac to publicly name, shame, and blame them if their words and actions have caused myself or others I may care about to experience pain or suffering, as counterintuitive as that may seem. Romans 12:19 ~ Do not take revenge, my dear friends, but leave room for God’s wrath, for it is written: “It is mine to avenge; I will repay,” says the Lord. I’m not in control of them or their journeys. Instead, wherever I encounter those who have been wounded by my spiritual siblings, I am to offer whatever aid and comfort I am able, without justifying or rationalizing or criticizing those who came before. I’m not into sports. I have cheered my kids along in the sports they’ve participated in and I can be interested in the games which are of interest to my friends, family, and associates, but I will probably never be a fan or truly “get” what it means to be passionate about and have allegiance to a specific sports team, say, like the Seattle Seahawks, the new NFC champions who are heading to the Super Bowl on February 2, 2014 for only the second time in their franchise history. Why do I know this collection of sports trivia? Because of all the voices around me, figuratively speaking, who are speaking up in passionate support and pride of this team. As a matter of fact, the “12th (wo)man” fans of the Seattle Seahawks have raised their voices and joined their enthusiasm together twice since 2011 to cause seismic events to register on the Richter scale. There is power in lifting our voices together, especially when those voices are in agreement. Have you ever attended a concert, conference, or some other stadium event where the people in the audience were invited to sing the words to a song or anthem they had in common together? When voices are raised in unison and harmony, it doesn’t matter if each individual voice is pitch perfect. The combined power of shared emotion, meaning, and experience unifies and transforms the disparate, individual voices into a singular, powerful, and magnificent voice that lifts and carries the hearts, minds, and imaginations of all who are participating. An army marches around the fortified walls, steps falling in unison, sending powerful vibrations from their steps into the ground, day after day for seven days. On the seventh day, that same army marches seven times around while the sound vibrations from seven ram’s horns are continuously being played. Then, a prolonged blast of the horns and the combined voices of every member of the nomadic nation of Israel in a mighty shout causes the walls to crumble and fall. So often that story is relegated to myth. However, after seeing how rowdy football fans can cause a minor earthquake, it seems less mythological and more plausible to me. Today, in the USA, we celebrate Martin Luther King, Jr. A flawed and human man who had a dream to end the prejudice and stigma separating and oppressing people because of the differences in the color of their skin and their genetic origins. There is still a very long way to go in achieving that dream. Fifty-one years ago, he raised his voice to share his dream for us to not walk alone but to march ahead in unity to overcome oppression, prejudice, and injustice. In a 2006 Special Report, the Bureau of Justice Statistics (BJS) estimated that 705,600 mentally ill adults were incarcerated in State prisons, 78,800 in Federal prisons and 479,900 in local jails. In addition, research suggests that “people with mental illnesses are overrepresented in probation and parole populations at estimated rates ranging from two to four time the general population” (Prins and Draper, 2009). Growing numbers of mentally ill offenders have strained correctional systems. A report on Gender, Race, and Mental Illness in the Criminal Justice System by Melissa Thompson, published through the National Institute of Corrections in the Corrections & Mental Health indicates that there is an inequality and disparity in psychiatric evaluations and mental health services received by African-American men who are incarcerated or supervised in the criminal justice system. Using federal and local statistics on the hospitalization and/ or incarceration of mentally ill persons, this article finds that psychiatric need is not the only factor criminal justice decision-makers take into account when seeking psychiatric explanations for criminal behavior. Instead, demographic, family, economic, and criminal factors are all important in predicting which defendants will be the recipients of psychiatric evaluations in the justice system. In this context, gender and race are important considerations. Violent women, for example, are more likely to be evaluated for psychiatric conditions, while African-American men are less likely to receive psychiatric evaluation. I can’t stress the importance of using our voices to share our experiences enough. I don’t know what the true statistics are, but for generations people have been taught to suppress the “crazy,” ignore the “down,” to hide the “different,” and to be ashamed of being weak and wounded. We are increasingly criminalizing and marginalizing those who are experiencing cognitive, developmental, and psychological impairments and damage, criticizing them for not being able to pick up and put together their broken pieces. For every individual who speaks up and shares his or her story, hope, strength, courage, and truth is shared with others who do not yet have a voice. If we raise our voices of experience together, we can drown out the voices of stigma, ignorance, and hate. For more stories of Magnificence, join the Creative Buzz Hop #34, hosted by Michelle Liew from Muses from the Deep and Tamara Wood from PenPaperPad. Having grown up, essentially growing myself up, dissociated and disconnected emotionally from my mother, peers, and experiencing no sense of family or community, having role models has always been a bit of a hit or miss challenge for me. My earliest role models were found in the books I read. I remember knowing that I was reading on fifth grade level in third grade because I was reading through The Waltons series of books. Now, I only recall what those books were about because of the television series, which can still be seen in syndication on feel good, vintage cable/satellite television channels. This series and others in the same genre, like the Little House books by Laura Ingalls Wilder, where the authors were fictionalizing real life and telling stories of kids who were experiencing life in a slower paced, less industrialized, time of community, family, and positive character, taught me life and people were not always what my experiences seemed to be teaching me. As I grew older and my reality got more and more difficult to cope with, I got into the childhood mystery series starting with Encyclopedia Brown, the Hardy Boys, and Nancy Drew. I loved the Bobbsey Twins stories. Child characters who were mostly left to their own devices, using their intellect to solve problems, figure out how to overcome threats, reveal truth, and bring justice to unjust circumstances became my obsessions. As an adolescent girl in the 1980’s I fell under the influence and sway of pulp romance books. Dreaming of exotic locales by women who were caught in traditional roles and traditional thinking, but trying to discover who they were and wanted to be, swept up in the worlds and actions of the men whose lives, passions, and wills seemed to overpower their own. Often, these books became physical weight to carry in my little white wicker purse and use as a weapon to lash out and punish the haters, teasers, and bullies who enjoyed getting me discombobulated and emotionally off balance. I escaped to the library and discovered the fantasy worlds of Xanth and Pern as created and described by Piers Anthony and Anne McCaffery. I immersed myself in Arthurian legend and alternative worlds melding magic and science, spiritual and secular philosophies. The characters I was drawn to and learning from were those who were coping with the displacement and confusion of not fitting into worlds they were thrust into but didn’t feel part of and/or living in worlds suddenly full of danger and conflict from things previously unknown or relegated to myth and make believe. By the time I was a young adult, parenting my son from mid-late adolescence, I started identifying and connecting with people who had what I wanted and appeared to have overcome dire and drastic life circumstances, trauma, and drama of their own. Seeking people who I could meet and interact with in person, within my community through church, college, and community services. Twenty years later, I’m still learning from everyday role models I meet and interact with, here online in the blogging community: writers, mothers, fathers, mental health professionals, persons experiencing mental health challenges, victims, survivors, and thrivers. Pastors, teachers, coaches, trainers. People who are in recovery and those seeking recovery. Yesterday, I met a woman I am seeking a mentoring relationship with, because she is doing what I want to do. She is functioning and operating as an advocate and guide for people who have experienced abuse to help them move through the lifelong impacts and consequences of having experienced those things, to find their voice and move into growing intentional and authentic lives based in their own value and identity. She is doing this after having gone through her own experiences of trauma and brokenness, from a life of childhood trauma to professional success, to personal breakdown. She has what I want and she is freely and willingly giving of herself to help me, and others, build and grow into that place inside of myself and for my life. Her name is Davonna Livingston. She is the founder of Changing Perceptions and author of Voices Behind The Razorwire: From Victims to Survivors, Stories of Healing & Hope. In the meeting she and I had yesterday, she shared something with me I didn’t know about myself. She had spoken of how she had connected with the various subjects in her book, through seeing herself reflected in their eyes and recognizing the shared connections between her and them. She shared how these women who were convicted criminals, often serving life sentences, had become her lifeline and support network while she was working through her healing and recovery process. I noted what an empowering thing that had to have been for them considering the “class” differences between her professional and educational status and upper/middle-class standing being connected and relating to these women as personal peers. Toward the end of the meeting, I asked what she had seen in my eyes. She told me that she had seen sadness and a sense of being lost, during the moments when I was sharing my origins story. Then, she told me that changed and shifted to excitement and hope, that my entire demeanor had shifted and changed when I began talking about what I’ve already been doing, including starting and writing this blog. This is the role model who is building into my life now, in the midst of many other role models who are showing and sharing their lives, their stories, and their courage every day in the forums we are connected with each other in online and in social media, as well as in the seats around me at weekly church meetings, group discussions, public transit, and walking down the street. For more discussion on Role Models and the Molding of Personality, check out The Seekers Dungeon. Romans 5: 1-5 Complete Jewish Bible (CJB) ~ 1 So, since we have come to be considered righteous by God because of our trust, let us continue to have shalom [peace] with God through our Lord, Yeshua the Messiah. 2 Also through him and on the ground of our trust, we have gained access to this grace in which we stand; so let us boast about the hope of experiencing God’s glory. 3 But not only that, let us also boast in our troubles; because we know that trouble produces endurance, 4 endurance produces character, and character produces hope; 5 and this hope does not let us down, because God’s love for us has already been poured out in our hearts through the Ruach HaKodesh [Holy Spirit] who has been given to us. To my way of thinking, bringing peace into the world outside of me, requires that I develop a peaceful character inside of my self, which infiltrates all aspects of my life. For me, peace comes from trusting God and choosing to think, act, and speak on the basis of that trust that God loves people and is in the business of reconciliation and restoration of relationships between people and Himself, each other, and within themselves. All the conflict and less than peaceful interactions in this world stem from people not being at peace within themselves and not being able to accept and trust that ways and experiences other than their own are as valid as theirs. We also tend to believe that pain and suffering shouldn’t happen to us and that if it does happen, someone should be held responsible and accountable to make reparations for the pain and suffering we have experienced and been subjected to. Here’s the this about that: pain and suffering are part and parcel of living life in a world full of people who have experienced pain and suffering. I’ve seen the statement: “Pain happens, suffering is optional.” At first I thought it was kind of a callous statement. Then I thought it was overly simplistic. Now, I’m coming to understand how profound it really and truly is. Suffering is a choice we make, whether we realize it or not. When painful, negative, disappointing things happen in our lives and we are affected, we can get stuck in the emotional and mental point of impact, reliving the loss moment after moment, creating our own sense of suffering. We often carry that into our next set of experiences with an expectation of more suffering, and unintentionally create the attitude and atmosphere which brings that expectation into fruition. This is neuroscience at work. I’m done suffering. I’m done taking my suffering out on those around me by being anxious, stressed, angry, bitter, resentful, and expecting bad things to continue happening. I don’t want to do it anymore. That means I have to retrain my brain to think differently and react differently to the things which happen in my life, most of which I have little or no control over, specifically how other people think, speak, act, and how they interact with me. So, that means, doing something different than what I’ve habitually done in the past. Back in December 2013, I shared about developing an attitude of gratitude and exchanging complaint for appreciation. My goal in 2014 is to make this my new default response to trouble, affliction, and painful circumstances. 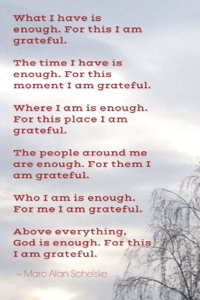 Any time I find myself in a negative frame of mind or overwhelmed with unmanageable emotion, I will recite and repeat these declarations of gratitude, and apply them in context of the circumstances, thoughts, and feelings I am experiencing. This is my plan for bringing more peace into the world in 2014.